can name all three branches of government. This is unacceptable! The three branches of American government are Executive, Legislative, and Judicial. This goes for state governments as well as the federal government. Branches of Power from the US Mint - interactive exciting game! The Government of Canada also has three branches with the same names as the USA's. However, there are some noteworthy differences between the American and Canadian arrangements. delegates wide regulatory powers to the executive." distributed across three branches of government — Parliament, the Executive, and the Judiciary. administers the law. The Judiciary interprets the law through the courts. than laws passed in Parliament." 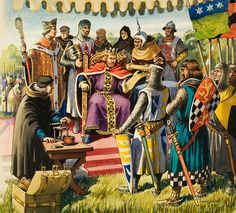 800th Anniversary of the Magna Carta was in 2015.
establishing that the King was subject to the law rather than being above it." "At its heart is the idea that the law is not simply the whim of the king, or the government. to parliamentary democracy, fair trial, and a series of controls on the abuse of arbitrary power." could not read or write. Neither could the nobles. Lincoln information, please see my page titled Abraham Lincoln Links." Kudos to Roger Norton, Webmaster! Their State of the Union Index has every State of the Union speech ever given since President Washington. . The American Revolution from American Flag Works. This is a well organized collection of links that cover (1) events leading up to the rebellion, (2) battles of the Revolution, and (3) the important people of the Revolution. This site draws on established sites like the History Channel and PBS. Thanks to Nancy Ward for the email! Did you know that mrnussbaum.com has the most extensive United States history section for kids on the entire internet? Explore our nation's great activities and enjoy hundreds of interactive or printable activities by clicking on the painting above! Animated Biographies from Mr. Nussbaum! "These animated biographies will bring the stories of famous Americans to life! Click on a story below to learn more. Please e-mail me to send feedback about these applications or to suggest subjects for future animated biographies." Biographies on Harriet Tubman, George Washington, Abraham Lincoln, Benjamin Franklin, Susan B. Anthony, and Christopher Columbus. More are sure to come! The Arabia Steamboat Museum (Facebook page) The steamboat Arabia (web page) left Kansas City one day in 1856, carrying 200 tons of supplies for settlements upriver. She sank. Over 100 years later, the wreck was discovered, buried 40 feet deep in the middle of a cornfield! So 200 tons of pre-Civil War artifacts were recovered and is now in the museum. Silverware, dishes, pistols, tools, clothes, coffee, fabric, kettles, teapots, frying pans, glassware, nails, screws, bolts, baby dolls, hats, shoes, boots, watches, gunpowder flasks, watches.. This is the largest collection of pre-Civil War American artifacts in the world. It's just amazing. Here is one of their many videos. Archiving Early America "Here at Archiving Early America, you will discover a wealth of resources — a unique array of primary source material from 18th Century America. Scenes and portraits from original newspapers, maps and writings come to life on your screen just as they appeared to this country's forebears more than two centuries ago." Excellent. Australian Explorers "...these brave men opened up Australia to settlement and allowed the colony to expand. In doing so, through their bravery, they wrote their names into the history of Australia." The stories of brave men who walked or sailed all over and around the continent of Australia, and sometimes died doing it. Horror, adventure, tragedy, epic survival tales, and great achievements. "Primary school children searching the Internet for information on Australian explorers often have difficulty finding information suitable for their year level. Hopefully, this page will provide them with an additional resource which they can access for help with school projects." Not just for Aussies anymore! Everyone can learn something of Australia's history here. Australian History Timeline "Featuring over 150 Film Clips showcasing a unique collection of Australian history documentaries matched with selected websites from Australia's national collecting institutions." Click Continue in the lower right corner of the intro screen (the big green screen) to see the sites' matrix of decades. The decade pages are packed with facts and photos. Click Search at upper right top to search by People, Place, or Decade. This page also lets you access film clips, related websites, and world events for each decade. Scroll across the decades from left to right. All in all a very useful and entertaining resource. The Aztecs One of 27 similar activities from Snaith Primary School. Good graphics. Learn all about the Aztecs! Then try out the story starters, quizzes, printables, Sunstone Puzzle, and coloring pages! Battle of Antietam September 17, 1862. In the South this fight is known as the Battle of Sharpsburg. This important Civil War battle was the bloodiest one-day fight ever in North America. The results led President Abraham Lincoln to issue the Emancipation Proclamation. This site from the Civil War Trust does a fine job of discussing the battle, and includes a good video (Antietam Animated Map), 360° panoramas of the area, many articles, and links to other Civil War battles. 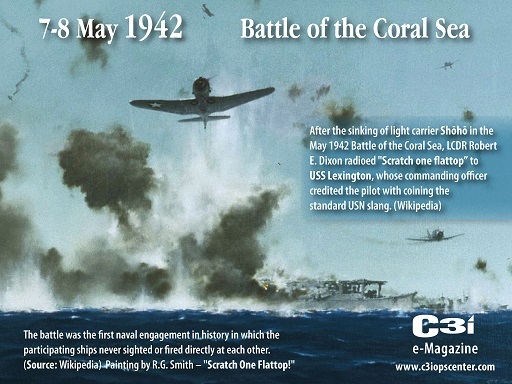 Battle of the Coral Sea 3 - 8 May 1942. 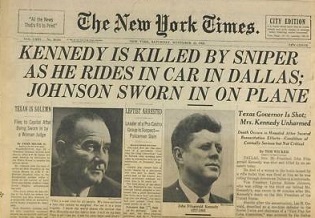 77 years ago. May they Rest in Peace. of Australia itself. 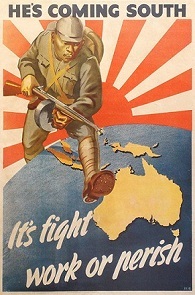 It must be held, or the Japanese will invade Australia. to land troops at Port Moresby. The Allied warships move to block the convoy's path. The Coral Sea Battle from History Animated A good compact summary! 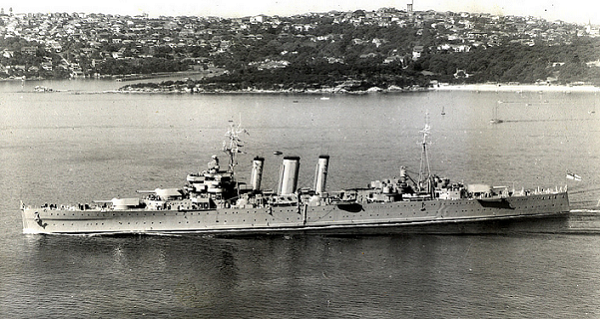 This is heavy cruiser HMAS Australia, one of the Allied ships. Another Japanese force of two big aircraft carriers ("fleet carriers") and more warships, are running interference to block any Allied warships and sink them if they can. The Americans have two big carriers of their own, out hunting for the Japanese. The battle lasts most of a week. The whole fight is between aircraft carriers. None of the ships ever sees an enemy ship. Both sides take heavy losses, but the Japanese retreat, and Port Moresby is never taken by them. Here is an excellent Australian account of the battle. Here is a very detailed Wikipedia article. "Port Moresby was important because any Allied attack north through New Guinea towards Rabaul required Port Moresby as a base. Similarly for any attack south towards Australia, the Japanese required Port Moresby". 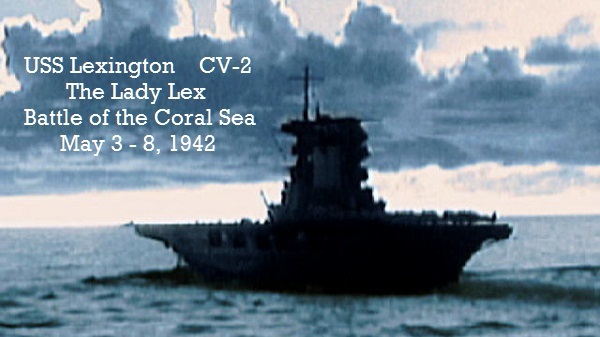 Results: USN loses the carrier Lexington. Lexington is on fire for three hours, but keeps flying off and recovering planes. 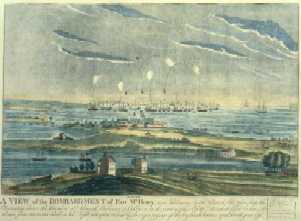 Some of Lexington's planes land on the carrier Yorktown and are saved. Carrier Yorktown is severely damaged, but limps home to Pearl Harbor. Full repair will take six months, but the dockyard has three days to patch her up before the next battle. The incredibly tough ship gets to Midway in time to join the fight. Japan loses the small carrier Shoho. 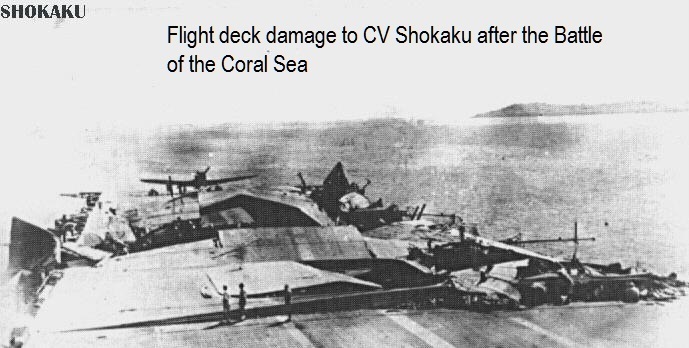 The large carrier Shokaku's flight deck is smashed beyond repair. No planes can take off or land. 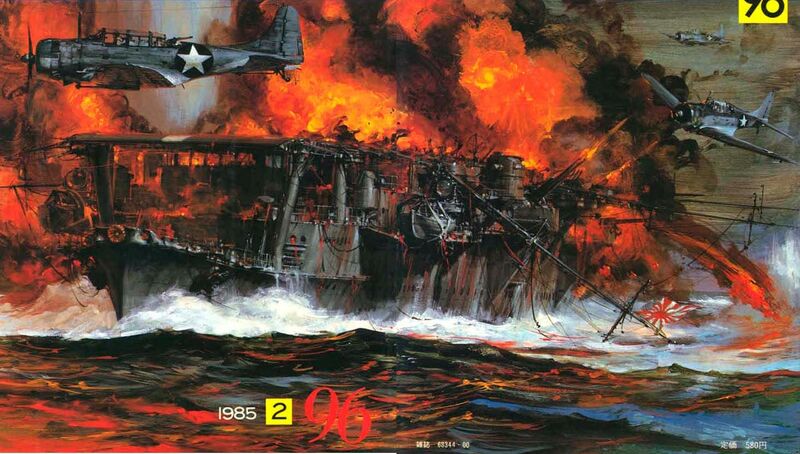 The other large carrier (Zuikaku) loses most of its planes in the fight. 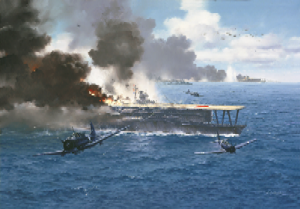 Allied navies would have moved all remaining planes to the one good carrier, but that is not the Japanese way; so neither one will make it to Midway. There's more! 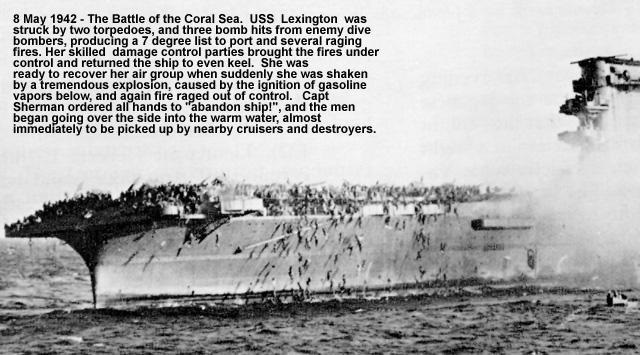 Sinking Of US Aircraft Carrier Lexington (1942) Pathe newsreel. 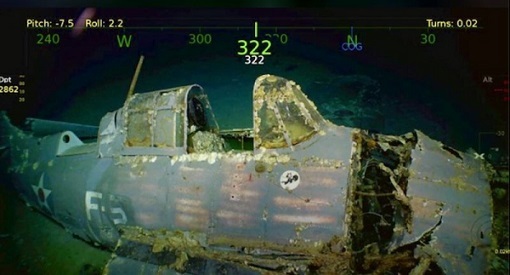 Battle of the Coral Sea photo gallery from The Australian. Battle of the Coral Sea Royal Australian Navy Official Site "Lest We Forget". Battle of the Coral Sea from the Australian Maritime Museum. This site has big! loud! pictures! and a good running dialogue. 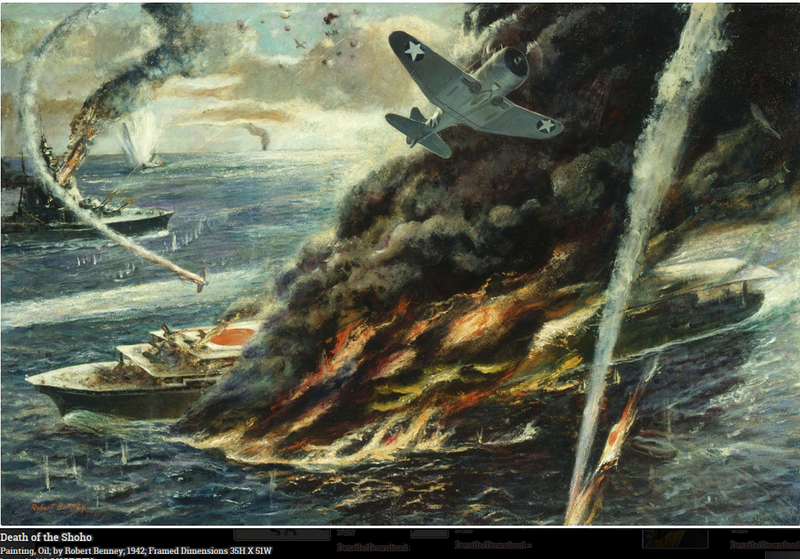 Battle of the Coral Sea from SlideShare A 54-slide show in a Q&A format, for learners. is the kids' Comments section, no adults allowed! If only the USA had something similar. know why. Low on gas? Engine trouble? and honored custom of logistics, called cannibalization or "parting out." Battle of Midway Learn about this pivotal battle of June, 1942, that decided World War II in the Pacific, even though the war went on for three more bitter years. 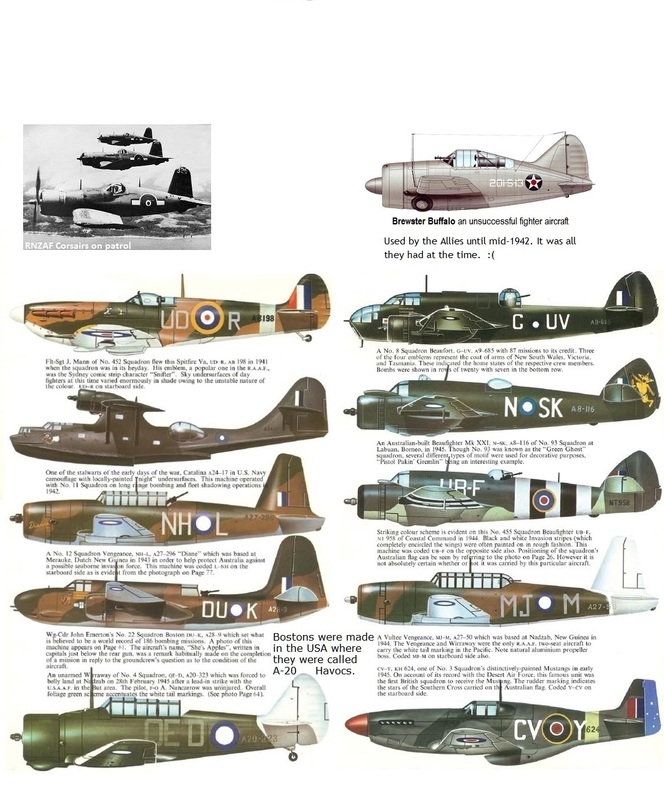 Special section about the sacrifice of the American torpedo-bomber squadrons, and links to the US Navy collection of World War II art. 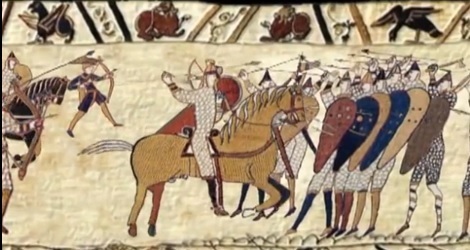 The Bayeux Tapestry from mrdonn.org. It's part of his awesome Middle Ages for Kids section. Students will find out (a) what a tapestry is, (b) who made this tapestry, (c) why this tapestry is important, (d) what the tapestry tells us about this battle of 950 (about) years ago. There are also plenty of links to videos, activities, PowerPoints, graphics, etc., including the excellent video Bayeux Tapestry - Animated Version. The Black Death Excellent one page lesson with graphics, from Mr.Dowling. They have a ton of lessons like this, to download for free! The Black Death: Bubonic Plague from TheMiddleAges.net. A one page summary with many links, including a relevant excerpt from Boccaccio's The Decameron. TheMiddleAges.net is a big site, with plenty of links and information about various topics from the time. 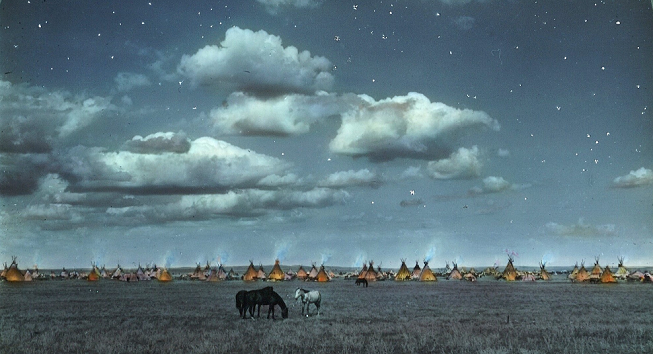 Blackfeet camp at night. Montana. 1800s. Glass lantern slide by Walter McClintock. Blackfeet stampeding bison over a cliff, in the days before horses. Buffalo (Bison) Education from the InterTribal Bison Cooperative . 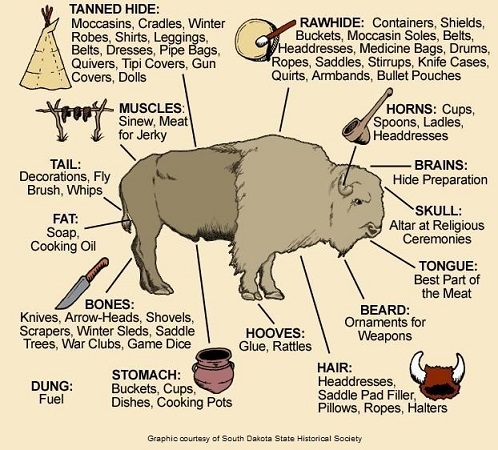 From the original people of the bison comes this excellent educational resource. 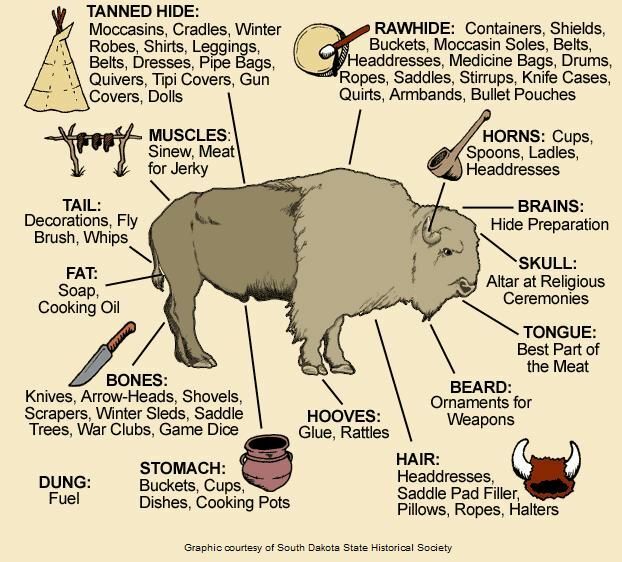 Learn the Traditional Uses of the Buffalo with a comprehensive printable .pdf chart. Learn why Buffalo Are Sacred. Learn buffalo facts, the Historical and Cultural Connection to the Buffalo and the awful Slaughter of the Buffalo. Find out about buffalo Meat & Nutrition, and recipes. Play the Buffalo Brain Busters game. Color in the fact-filled Coloring Pages for Kids. Father of King Sweyn Forkbeard. 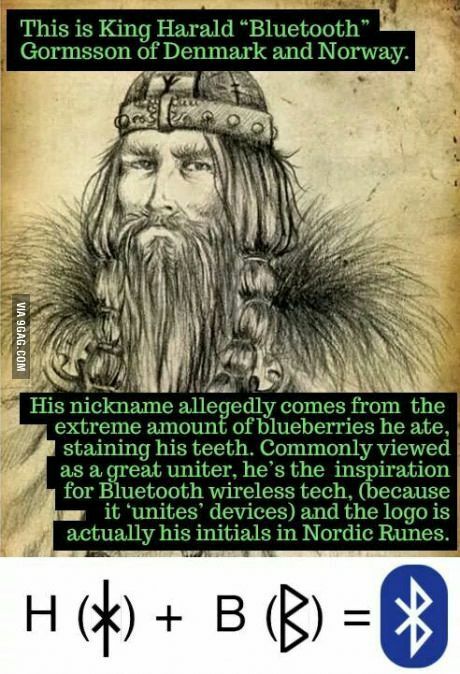 Grandfather of King Canute the Great (Knut Svensson). Castles on the Web "offers an extensive database of all things Castle related including a castle photo gallery, free castle web pages, hundreds of castle links, castle site of the day, castles for kids and more!" For our favorite trio of 10 year old castle freaks, and a few hundred thousand more like them. Chinese Zodiac Why was 2016 the Year of the Metal/Red Monkey? How many animals are there, how many colors and elements? What is there a 60 year cycle and a 12 year cycle? Find out all about it this series of sites. Each animal in the zodiac gets its own long page of facts overload! At the bottom of each page is a list of all the animals in the zodiac. Each has its Chinese character and audio of how to say it in Chinese. Quite a resource! The Civil War for Kids "The students in Mrs. Huber's class at Pocantico Hills School in Sleepy Hollow, New York have been learning about the Civil War. We read about this important time in our nation's history and wrote about it. We made a timeline of important events from 1860 to 1865. Our bar graphs contain data about the North and the South in 1861 when the Civil War began. Each graph compares the resources of the two regions. We looked at Civil War battle victories, used our mapping skills to examine the nation in detail, and made both Confederate and Union flags. We have drawings of Civil War uniforms, short biographies of Civil War leaders, images of other leaders, links to other Civil War Sites, and activity sheets for you to do. We hope you enjoy our work!" A note about American Civil War battle names: Some names differ from North to South. 1st and 2nd Bull Run (the creek) are called 1st and 2nd Manassas (nearby town) in the South. Same for Antietam (the creek), called Sharpsburg (nearby town) in the South. taken at the blockade of Charleston, SC. 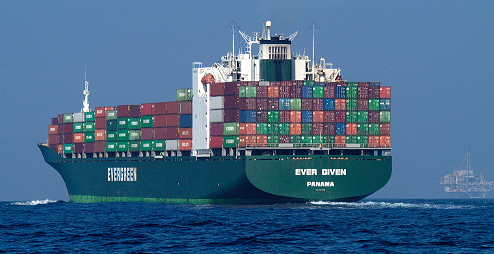 Container ships. In the 1950s, shipping by sea was so complicated and expensive that most companies stayed away from it. 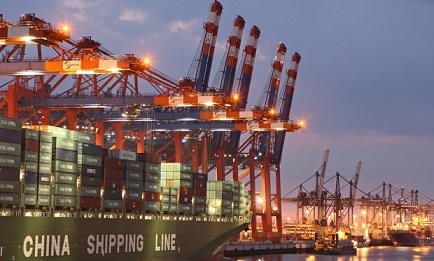 The video, and its article and graphics, explains the origins of the container ship and how they drastically changed the world. 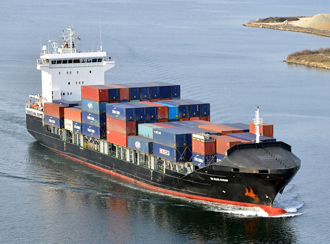 "Containers can be transported by container ships, trucks, and freight trains as part of a single journey, without unpacking." - Wikipedia. 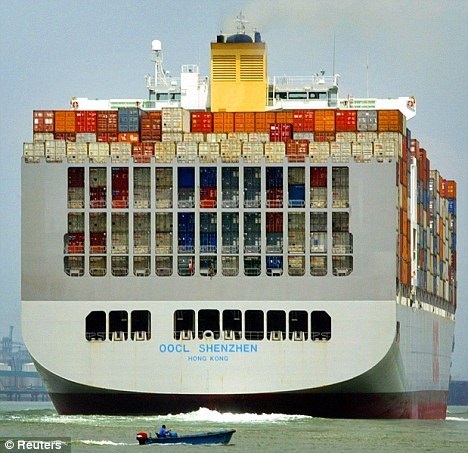 Huge ships carrying hundreds of 40 foot sealed containers lowered the cost of shipping by about 90%. Now it was cheap to get goods to markets on the other side of the world. It was also cheap to buy imported goods. Therefore WalMart and the other "big box" stores with mostly imported goods. Now everybody uses containers. Have a look at these monster ships! Could you pass a US citizenship test? Here is a 96 question test covering what you would need to know in order to pass the citizenship test. OK, American citizens, let's see how you do! Useful for civics and government classes. D-Day There are so many resources on the web about this pivotal event in world history, the Allied invasion of Normandy, June 6, 1944. This one is a very good resource from the BBC, with graphics. The Doolittle Raid Our page of links about this famous World War II incident. Learn the history, learn about heroes. Ellis Island Americans - Learn about your ancestors at THE site to learn about immigration. Records of ships and people! Frontier Culture Museum of Virginia "tells the story of the thousands of people who migrated to colonial America, and of the life they created here for themselves and their descendants. Many were farmers and rural craftsmen set in motion by changing conditions in their homelands, and drawn to the American colonies by opportunities for a better life. Others came as unwilling captives to work on farms and plantations." The Exhibits show typical buildings from each ethnic group and a page of facts for each group. George Washington Quotes from Notable Quotes. Nine pages of quotes, around 25 to a page. Also has a good biography and a trivia quiz. Great for American history among other things. The man wrote quite well and he knew his grammar. Painting by Winslow Homer: "Prisoners at the Front" (1863). 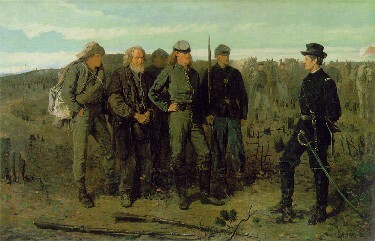 Union Brigadier General Francis C. Barlow talks with Confederate prisoners of war at Gettysburg. Badly wounded several times, Barlow ended the war as a Major General. Later in life, as Attorney General of the State of New York, Barlow successfully prosecuted Boss Tweed and broke the Tammany Hall gang. A famous American painter, Winslow Homer was a combat artist during the war. This is one of many paintings that he drew from sketches he made during the action. Gettysburg Civil War site for kids, from the National Park Service. Investigates the causes of the war and the larger conflict, too. Gifts of the buffalo. This graphic lists many of the gifts. Not everything is listed, but the People used everything. Go Social Studies Go "Go Social Studies Go integrates fun content with the coolest links, videos, and games found on the net. In addition, we’ve teamed with with Cramstoppers, a free quiz making site that allows students to take their education one step further. " This site constantly adds new things to read and do. American and World History, World Geography, Global Religions, Choose Your Own Adventure, links, more. Oodles of subcategories in each! We ran on the Underground Railroad, read about Archduke Ferdinand's assassination, checked out the Silk Road, learned about African geography ("Place is huge!"). This is middle school through high school level, maybe first year college - anyway, excellent site! Shout out to "veteran social studies teacher" Ken Uhde, of Groves High School, Birmingham, Michigan, its creator! The Gothenberg is a 2003 replica of a Swedish East Indiaman. used ships like this to trade with India and the Far East. Götheborg is one of the world's largest operational wooden sailing vessels. with some 1,000 wooden blocks and 1,964 m2 (21,140 sq ft) linen sail. All this was produced using 18th century techniques. This is not a model, it is the same size as the original. by 10 cm, since today's seamen are taller than their ancestors." Historical Atlas of Europe from Year 1 to 2000 ..."shows the history of Europe through a sequence of 21 historical maps, every map depicting the political situation at the end of each century." Great history resource. History of Labor Day From the US Department of Labor. Find out the history of the holiday, learn why it is more than just another Monday off. HMS Victory official site. 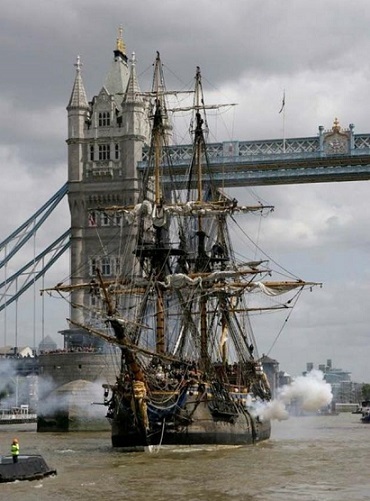 Learn about the world's oldest warship, in service since 1765! 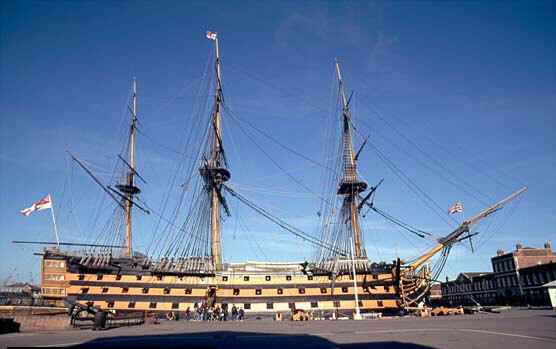 The only surviving "First Rate" wooden battleship in the world, HMS Victory was Lord Nelson's flagship at the Battle of Trafalgar back in 1805, and is still on duty with the Royal Navy today! Use the menu across the top of the screen. Interactive views of different decks. Photos of the interior and famous paintings. The various stats would be good for mathematics classes. and sail back to Spain. One ship made it back, but Magellan didn't. It was all about the money from the spices. WE ARE A HORSE NATION “This Film will tell the world our stories, and show the world our visuals, from our own perspectives... as the Oceti Sakowin. To present a quality Documentary Film that will tell the story of why we (Oceti Sakowin) are a “Sunka Wakan Oyate” (Horse Nation). This film will present that story through the voices of the Oceti Sakowin (Lakota, Dakota, & Nakota). This project will be a working example of the philosophy of the Oceti Sakowin, and as “relatives” we will bring together Traditional & Contemporary Lakota/Dakota/Nakota songs, stories, teachings, experiences, knowledge, thoughts & beliefs, to be compiled for a one-of-a-kind film resource; to be utilized by the intended audience of the future generations of the Oceti Sakowin." This is a seven minute preview. The links change sometimes. This animated map shows how humans migrated across the globe. From Business Insider. "It's tough to know what happened on Earth thousands of years before anyone started writing anything down. But thanks to the amazing work of anthropologists and paleontologists like those working on National Geographic's Genographic Project, we can begin to piece together the story of our ancestors. Here's how early humans spread from East Africa all around the world." I Was Wondering.org Introducing women's adventures in science! Bios and timeline of 25 women scientists who have made this a better world. Ten of them their own pages on this site! There are games and an Ask It section for your questions. Girls can too do science! Thanks, Terri. (The) Ice Trade In this history game set in the 1800s, students send 10 ships loaded with ice from New England to Florida, Brazil, or India. Can you turn a profit in 10 turns? 1963 - "Lest we forget." Jamestown Settlement "In 1607, 13 years before the Pilgrims landed in Massachusetts, a group of 104 English men and boys began a settlement on the banks of Virginia's James River..." Well done site explores the history, the different peoples - native, European, and African - and the world of 1607. The YouTube videos greatly enhance learning. Kathi Mitchell's Civil War links. A big list of links to sites about the American Civil War, 1861-65. A good place to go for links. Kathi Mitchell's Social Studies links A big collection of links to sites, arranged in sections. Her list of Native American links is superb! Khan Academy "is a not-for-profit 501(c)(3) with the mission of providing a world-class education to anyone, anywhere...We are complementing Salman (Khan's) ever-growing library with user-paced exercises--developed as an open source project--allowing the Khan Academy to become the free classroom for the World." 1800+ videos cover math from 1 + 1 up through differential equations; Science: Biology, Chemistry, Physics, Organic Chem, Cosmology, Astronomy; History; Finance (BIG section! ); Test Preps for: SAT, GMAT, CAHSEE, IIT JEE. The videos are wonderful! This is amazing and FREE! Kids Past from KidsKnowIt. "KidPast.com is the fun way to explore our history. We are who we are today, because of those who have gone before us. " The Online History Textbook does a good job of covering elementary and middle school history. The History Games are pretty good. The Historical Quotes are over the top, and every child should know of them. Kids' View of World War II and the 1940s Era from the Spring Hill Elementary School in Kansas, this older site (2000-2001) works to bring the World War II era to life for contemporary kids. Made by 5th graders and their teachers. Interviews with veterans and civilians alike brings a unique touch. Also covers fashions, entertainment, toys and games, and has a timeline. Thanks, Mrs. Vopat and Mrs. Jones, and the Jr. Ikes Teams. 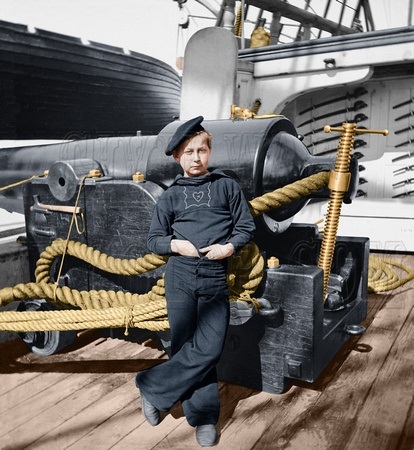 KidsKonnect Civil War links. More links to sites about the American Civil War, 1861-65. Good page layout sets the mood, too. "Port Moresby was important because any Allied attack north through New Guinea towards Rabaul required Port Moresby as a base. Similarly for any attack south towards Australia, the Japanese required Port Moresby as a base." Japanese forces took over the Solomon Islands, New Britain, New Ireland, and the north shore of New Guinea. They captured the big Allied base at Rabual on New Britain. After the Coral Sea battle, Japan decided to take Port Moresby by land. This meant marching south across the island of New Guinea from sea to sea; up from the north shore, south through the jungle, over 11,000 feet/3,350m mountains, through deep canyons and steep ridges, to the south shore and Port Moresby. The regular, veteran Australian soldiers were off fighting in faraway North Africa; or had already been captured by the Japanese in the Dutch East Indies, Malaya, or Singapore. The Australians called up volunteers and reserve units of untrained men with old gear and leftover weapons. The Japanese had artillery (75MM "mountain guns") and the Australians had none. The Australians fought, lost, and fell back south. This happened several times. Japanese Army units got within sight of Port Moresby when they stopped their southward advance at Ioribaiwa Ridge. They were 40 Km/24 miles from their goal. Imperial Army HQ ordered the halt because: (1) The game and stubborn Australians were falling back much too slowly to suit them, and (2) US Marines had landed on Guadalcanal and were destroying Japanese units sent to stop them. Japanese Army HQ decided to go after the Marines first and then to push on to Port Moresby. "Senior Japanese officers interviewed after the war thought that the factor most influencing the postponement was not Guadalcanal but rather 'stronger than anticipated' Australian resistance at Kokoda." 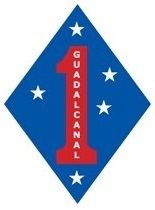 Besides, the Japanese did not believe that the Americans could hold on to Guadalcanal for very long. The Allies used this halt in the PNG fighting to send Australian veteran units back from North Africa; and to send in American troops, aircraft, and more ships. This time, the Allies had more aircraft, organization, and artillery. It was the Japanese Army's turn to get pushed back, all the way to the north shore. Every sub-topic has an education section titled "Teaching and Learning Activities for the Classroom." These are challenging, pre-made lessons for students, designed to get them acquainted with the history. They are very good. 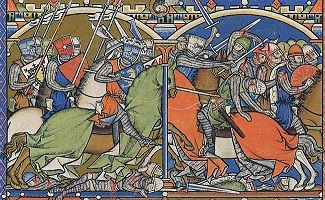 The Animated Battle Maps show every move each side made. Lakota Winter Counts - An online exhibit from the Smithsonian. Who are the Lakota? What's a Winter Count? Who made them? What art media were used? Listen to Lakota elders explain the records of the years. See surviving winter counts from as far back as 1701. The gallery of winter counts is awesome. (To scroll right or left, put your mouse arrow in the upper left or upper right side of the picture.) Bonus: Native speaker pronounces Lakota words for you! Click on the tiny white words "Audio Glossary" that are underneath the main site. Sirius at Wikipedia plus an X-ray photo of Sirius-a with Sirius-b peeking over its shoulder. 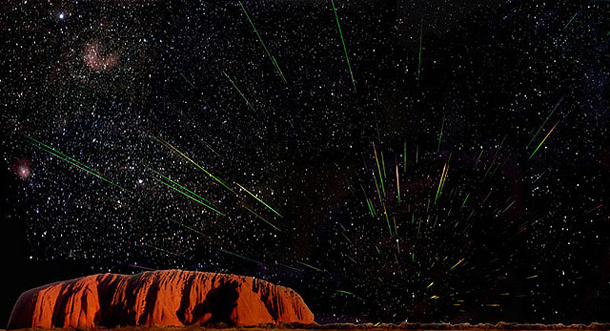 Let's Get 'Sirius' About the Dog Star, Sky's Brightest Twinkler from Indian Country Today Media Network. 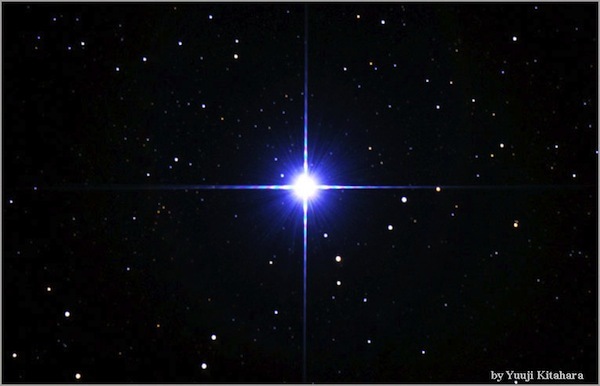 Facts about Sirius, but mostly tells how the star was regarded in Native American/First Nations cultures and in the myths of various tribal nations. Very good reading. If you don't see the star's photo on their site, click on the graphic. Lewis and Clark- The PBS site. Includes teacher resources. National Geographic's Lewis and Clark site, with interactive map. NatGeo also has an (even more) kid-focused L & C site. Liberty! Includes the Road to Revolution activity. From PBS. Liberty's Kids! Great companion site for the TV series shown on PBS. 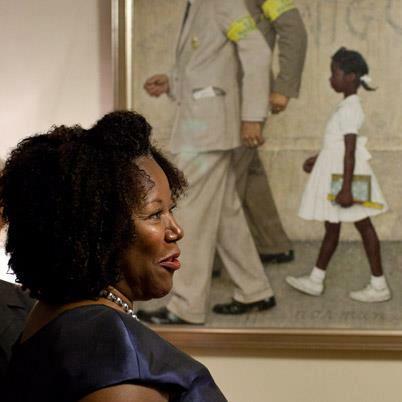 We now have a Civil Rights page that covers Black History and more! Mavis Staples - "Down In Mississippi" - Blues video - actually an oral history - describes growing up black and female in the bad old days. Also praises Dr. King. Medieval Map "This website illustrates the historical changes that occurred in the Medieval Era (400 - 1500) with an interactive map." Understatement! Move back and forth through time in 10 to 50 year intervals. Click on one button to show cities, another to show decisive battles. Click the ? button to see a modern map. For battles, there is a brief synopsis in a popup window, with the option to go to Wikipedia. Clicking on a city icon sends you directly to Wikipedia. The map shows all the contemporary peoples and states for the period you choose. Clicking on any label (example: "Balts") brings up a three-section pie graph. One section - the "W", sends you to Wikipedia. Clicking the folder" icon opens up a book or article, if there is one (in this case an e-book called "The Balts", by Marija Gimbutas). Clicking on the "film" icon will open a video, if there is one. The site is constantly being improved. It's quite a trip through time for middle school and older. Visual learners may finally grasp the idea of huge groups of peoples moving across Europe. See empires and kingdoms rise and disappear. Wonder at the names of people and places: Umayyads, White Huns, Polotsk, Navarre, Swabia, Trebizond, the Obotrites, Erik Blood-Axe, Attila the Hun, Harald Bluetooth, the Bulgars, Sven Fork-Beard, Harald Hard-Advice, Charles the Hammer, and all the rest. Mission 1: For Crown or Colony? It's 1770. You are Nat wheeler, a 14 year old apprentice in Boston. When fighting starts, what will you do? Mission 2: Flight to Freedom It's 1848. You are Lucy King, a 14 year old slave in Kentucky. Will you find a path to freedom? Mission 3: Cheyenne Odyssey You are Little Fox (Háahke'ma'ehóóhe), a Cheyenne boy (Tsétsehéstaestse). 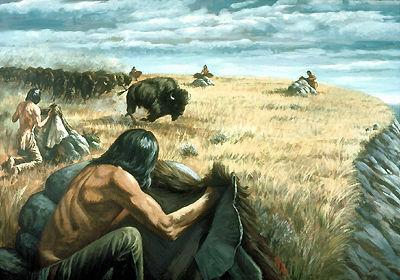 Can you help your people survive life on the Plains? Mission 4: City of Immigrants You are Lena Brodsky, a 14 year old immigrant from Russia. How will you start a new life in America? Players interact with speaking characters in authentic situations. Games can be saved and resumed later. There are also Think Fast games that test your knowledge of the times. Moundbuilders Teacher's Guide for Native American Heritage Month. From the American Indian Cultural Center and Museum (AICCM) of Oklahoma. Excellent self-contained teaching unit ready to go! Amazing art, artifacts, in-depth discussion of various moundbuilding Native American cultures over 11,000 years, from prehistoric times to the 1500s. Lots and lots of art! Plenty of activities. Mount Rushmore National Memorial This is a multimedia site from CyArk. It is fantastic. This presentation starts with a slideshow. Other sections off of the horizontally scrolling main section cover the Black Hills, Gutzom Borglum, carving the sculpture, preservation, how CyArk digitally documented the Memorial for posterity, laser scanning, photography, the Virtual Tour, videos (including the Tom Brokaw intro that you watch at the Memorial), and 2D & 3D perspectives. Marvelous job. Our fave is the very cool Virtual Tour, showing everywhere you can go. If you cannot visit Rushmore then this is the way to go! Visualize someone taking the virtual tour while standing on the same spot! National Archives "The National Archives and Records Administration (NARA) is the nation's record keeper. Of all documents and materials created in the course of business conducted by the United States Federal government, only 1%-3% are so important for legal or historical reasons that they are kept by us forever... Those valuable records are preserved and are available to you, whether you want to see if they contain clues about your family’s history, need to prove a veteran’s military service, or are researching an historical topic that interests you." This is a treasure trove of original, primary source documents. Click here to research records. Click here to look for Veterans Service Records and other military. Click here to see Teachers' Resources. The Declaration of Independence, the Constitution, Emancipation Proclamation, Civil War records, World War 2, FBI, CIA, and OSS films on DVD, military service records, it is all there. They also have branches all over the US. 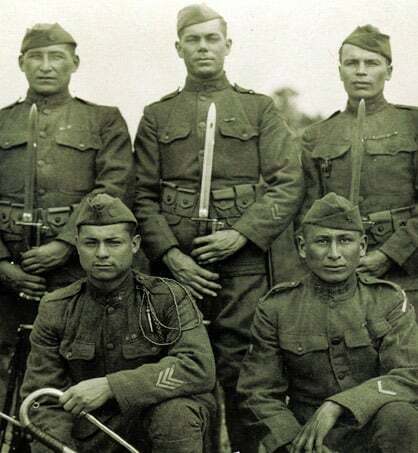 Native Americans and the U.S. Military Gives the history of Native Americans in all branches of service during the past century. Also lists the eight Native American Medal of Honor winners from World Wars I and II, Korea, and Vietnam. Information about Code Talkers of different nations. Native Americans in the US Army Lots of links, videos, biographies, a Comanche Code Talker, and more. Includes Willing to Serve, a cross section of Native veterans and active-duty. Native Americans in the US Navy Primarily about World War II, Korea, and Vietnam. Biographies of famous Native sailors, including Commander Ernest Edwin Evans, USN, Medal of Honor, WW II. There is also a nice PowerPoint about Native sailors past and present, including a Navy Seal Medal of Honor winner from Vietnam. While removing and replacing old blackboards with whiteboards, contractors found still older blackboards behind them! Why were they left there, in 1917? Was it easier to cover them up instead of taking them down? Whatever the reason, those old blackboards are full of drawings, lessons, math problems, Thanksgiving art, and music! It is like a snapshot of everyday high school life in 1917. There are 14 photos in this article for your enjoyment. Can you figure out how to do the multiplication wheel? The lost art of Penmanship - their handwriting was amazing! The art is so clear it looks like it was put up this morning, not late November 1917! "Hopefully, the spirit of these teachers and their students will be enjoyed for many years to come. Who knew that scribbles on a chalkboard could become such a precious piece of history." More Historic Chalkboards Found At Emerson High School in Oklahoma City Even more are found! Good photos. Chalkboards With Lessons From 1917 Uncovered at Oklahoma School - Well done video from NBC Nightly News. The Opium Wars In the 1800s, Britain fought two wars in China over opium. The British used military force to smash Chinese government resistance. 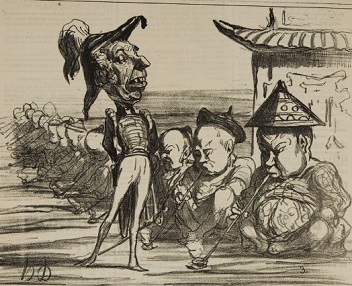 China was forced to buy opium from British merchants, who sent vast quantities of opium into China. Millions of Chinese became opium addicts. This was like drug lords attacking your country and winning, and then ordering your country to buy their drugs! Click on the link for the nasty details. "The legendary trail has carved itself into American history—and, in some places, into the earth itself"
steep and rocky one mile of ruts cut into a cliff at Biggs Junction, Oregon. See these and more at this site. Can you imagine what it must have been like? Oregon Trail for Elementary Schools Arguably the best Oregon Trail site. Plenty of information and links. Comprehensive overview of life on the Trail. William has a broken arm. You have died of desentery. History of the Oregon Trail and Pioneer Families of Oregon - from End of the Oregon Trail Anything you would ever want to know about the Oregon Trail, the rival trails, some of the families who traveled them, and much more. This huge site could be and should be the source of many K-12 lesson plans. You should have bought more baking soda saleratus. You do not have an extra wagon wheel, so you must trade for one. Oregon Trail Links A large list of links to other OT sites. If you continue hunting in this area, game will become scarce. 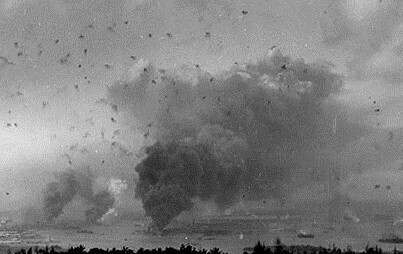 Intense Pearl Harbor Photos Show Why The U.S. Went To War Epic photos from the US Navy archives. and the Attack on Pearl Harbor. If students want to know why it happened, this is a good material source, even though it has lots of grammatical errors. This section includes the complete text of FDR's "Day of Infamy Speech". is a teaching DVD from izzit.org, makers of creative educational DVDs covering a wide subject area. 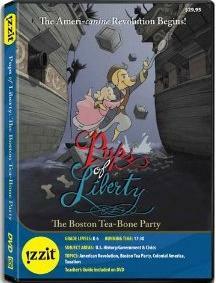 The people of izzit asked GSFK to review the DVD, and this is our take on it: Pups of Liberty is a 17:30 long, very well done, professionally voice acted video about the events culminating in the Boston Tea Party. "The Boston Tea-Bone Party tells the story of the founding of the Sons of Liberty and the Boston Tea Party, but with the real people of history portrayed by cats and dogs." The colonials ("Spaniel Adams", "Paul Ruffere"), and the British ("Royal Tomcat") come across as believable characters. "No Taxation Without Representation" becomes "No Laws Without Paws". This video will hold elementary students' attention and keep them interested in the dramatic events of the times. A little girl dog is the heroine and the "kid focus", but she's definitely an active member of the group. Dogs and cats portraying actual characters speak and act as the real people did. Obviously it's a bit simplified but the events and ideas are covered and explained. There is a pretty good companion web page for kids here. It covers the historical people, places, and events; has a coloring page, and a section on the making of the video. We all thought the DVD well worth the price. It makes a valuable supplement to any elementary classroom and school multimedia resources. Primary Documents in American History From the Library of Congress, this site covers the Declaration of Independence, the U.S. Constitution, the Bill of Rights, the Federalist Papers, documents from the Continental Congress and the Constitutional Convention, 1774-1789, and has a Guide to American Historical Documents Online. There is nothing like reading the original documents! REVOLUTIONARY WAR: Birth Of A Nation "Welcome to Historycentral's Revolutionary War site.This is the most complete site on the web on the Revolutionary War. 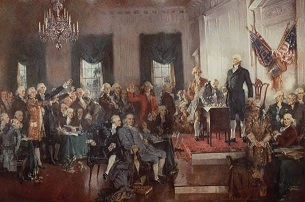 The section on the 'Causes of the War' traces the events that led to the American Declaration of Independence. The 'Battle' and 'Main Event' sections tell the story of all the major battles of the war. Many battle entries come with a narrated multimedia presentation that last up to three minutes. A NEW SECTION chronicles many of the major legends and myths of the war. Each story comes with the written text as well as a multimedia presentation; perfect for students of all ages. For those who want to learn more, we have added sections on the Economics, Daily Life and Arts of the period. Our site includes extensive first-hand accounts of battles, along with many other primary source documents. Our Student Guide lists the important terms from this period. Our Teacher's Guide includes many lesson plans with resource materials and ideas on how to teach the American Revolution." South Dakota History for kids. This is the official South Dakota 4th Grade state history unit. Covers prehistory to modern times. SquinchPix Image Resource - "An Archive of European Imagery" Utterly astounding. Many thousands of artifacts, sculptures, paintings, castles, churches, temples, dishes, jars, ancient helmets, Minoan buildings, Pompeii, cathedrals, etc etc etc. All labelled by date made/built and location. TimeMaps specialise in map-based history timelines. TimeMaps' FREE interactive World History Atlas is the most comprehensive history atlas on the internet. Inside you will find over 1,500 maps, well-written historical overviews, depth-articles, images and much more. Maps and timelines (timemaps) of every civilization, nation and empire. See the geographical context, chronology, connections and big pictures of history. FREE!" Fabulous interactive maps that branch off fractally, let students explore everything about the history of any part of the world from 3500 BC (5500 BP) to the present day. A short video shows some examples. 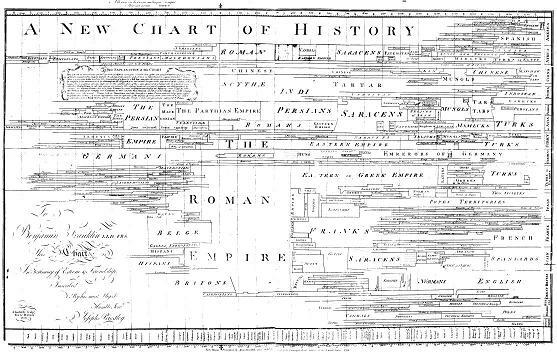 The Atlas shows relationships between peoples and civilizations using graphics and text. It's full of information. 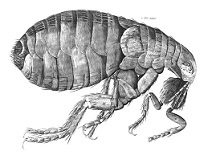 There are also very good and inexpensive iPad, iTunes, and Chrome apps for sale, from $1 to $3 that we saw, and at least one (The Black Death) for £1.99. Are the apps worth it! In a word, yes! Our historian was nearly drooling. They also have available various teaching resources and materials. Popular Topics Click & grab the big orange button, then slide the big orange button to see 13 interactive history timelines for different parts of the world. This site is everything it claims to be! Enough! Go see it for yourself! Titanic - Titanic Centennial 1912 - 2012. Our page of links about the history of the tragic 1912 voyage of the RMS Titanic. Tradesmen in Colonial America from Pocantico Hills School. "...the Colonists had little to export as trading partners with England, so they had to make what they needed to survive. Eventually they had enough money to pay those skilled craftsmen to make what they needed. You are about to meet some of these tradesmen. We hope you enjoy visiting this period in our history." What did these tradesmen and craftsmen (& women) make? Find out about 15 different trades, from shoemakers to doctors to milliners. Check out the Activities and Links as well. Learn about even more tradesmen, such as brickmakers, gunsmiths, apothecaries, weavers, and more at the Colonial Williamsburg site. What did a cooper make, anyway? What's a wainwright? Traitors, Seamstresses, and Generals: Voices of the American Revolution American Revolution ThinkQuest site. Well organized, tons of information. Fits very well with any classroom study of the Revolution. Packed with resources and activities. Succinctly stated: One of the best ThinkQuests we have ever seen. U.S. Constitution for kids, from usconstitution.net. Separate explanations of the Constitution for: Kindergarten - 3rd Grade, for 4th - 7th Grade, and for 8th - 12th Grade. There is also a Teacher Guide to the material. Happy Fourth! Did you know that mrnussbaum.com has the most extensive United States history section for kids on the entire internet? U.S. Presidents Here's a valuable site with amazing amounts of information about all 43 U.S. Presidents! Click on any portrait in the matrix of 43 and read the facts. "Currently, U.S. Presidents offers brief overviews of the 43 presidents by way of outlining the major points taken from the following three areas of each president's life: Early Life/Pre-presidency, Presidency, and Post-presidency/Legacy." J.W. Smith, the creator and curator of this website, plans to expand it to include Vice-Presidents, First Ladies, and much more. You should read over his About section to find out more about that and the site. While you're there, check out Roosevelt! Thanks to J. W. Smith for the email. US Presidents List Lists all US Presidents and Vice Presidents (wow) with links to tons of facts about them. A good gotta-have source of information. Victorian Britain from BBC Primary History. Be a kid in the time of Victoria! Rich kids were warmly dressed, well fed, and went to school. Poor kids wore rags, were half starved, and went to work as coal miners and factory workers. See their toys and how kids lived in this split society. Check out the Activities and the Fun Facts, too. USS Constitution official home page. Learn about this famous frigate's history, and take a Virtual Tour of the recently restored ship. Living history. USS Constitution fights HMS Java off the coast of Brazil. War of 1812 - one of several spinoffs of the Napoleonic Wars. Ultimate History Quiz History Channel's excellent American History Quiz! Play single player, multi player, or against friends. Ten questions, choose your level of difficulty. May be addicting. Best for 4th grade and up. War of 1812 Our big, special section about the War of 1812! It's a big page! Click here to start the adventure! Watch Paper Ships and Vikings Set Sail on a Stop Motion Adventure 4:00 NatGeo video "You might find yourself in similar territory watching this intricate short, which tells the story of a boy learning the Viking method for building a ship, then setting sail on an ocean voyage. Our animators brought this ancient world to life using only paper! (Want more? Click here to watch their paper history of London.) " Detailed description of how to build a Long Ship. Watch the United States Grow This animated gif created by redditor Anthony Vincent (we can't show his reddit name on a kid site), lets you watch the expansion of the USA from 1789 to 1959 (question for students - Why 1959?). States, territories becoming states, treaty effects, the Mexican and Civil Wars, the California and Texas Republics joining as states, and the stealing of the Kingdom of Hawaii are all here. * You'd better not blink - this is VERY fast. Perhaps teachers could assign groups of student to watch different sections of North America? * Missing are American Samoa, Guam USA, Puerto Rico USA, the Virgin Islands USA, and small atolls & rocks in the Pacific. Well, hey, you can't have everything! We Choose The Moon is an interactive experience recreating the historic Apollo 11 mission to the Moon in real time. Once where only three men made the trip, now millions can. Live event begins 8:02 AM EDT July 16, 2009, with launch at 9:32 a.m., exactly 40 years after Apollo 11 lifted off. Were the Middle Ages Dark? 5:46 video. There is no period in history more misunderstood than the Middle Ages. Providence College Professor of English, Anthony Esolen, vividly demonstrates why the "Dark Ages" would be better described as the "Brilliant Ages." His debatable points would make a good springboard for discussions in an AP class. What childhood was like before labor laws This article from Upworthy was titled "These photos and stories reveal what childhood was like before U.S. labor laws." "For centuries in the United States, child labor was all too common. Despite efforts from educators to encourage primary school, an immigration boom in the latter half of the 19th century resulted in a new pool of child workers. The influx of low-earning, compliant young laborers coincided with the rapid expansion of industrial positions in mills and factories. Children worked long hours, often in cramped, dangerous conditions, to help support their families." Out of 5,000 + photos in the National Archives, here are 14 with typical situations of kids working hard for tiny wages. The Great Depression, the Child Welfare Act of 1938, and automation finally did away with most of the child labor jobs. See the photos and read the stories. The Swashbuckling History of Women Pirates from Smithsonian magazine online. "When women roamed the high seas in search of fortune, freedom, and sometimes revenge." This page wants to make sure the newly discovered history of women pirates does not get re-buried. A woman historian named Laura Sook Duncombe wrote a book about them - Pirate Women: The Princesses, Prostitutes, and Privateers Who Ruled the Seven Seas Everyone knows about Mary Read and Anne Bonny. What about Ladgerda, Grace O’Malley, the great Chinese woman pirate Cheng I Sao, Queen Artemisia of ancient Greece, Lady Mary Killigrew, the Moroccan pirate queen Sayyida al-Hurra, and many more? “I wanted something to point at as incontrovertible truth that women are as much a part of pirate history as men,” Ms. Duncombe said. This is a good read, the interview was done by a female lawyer, which counts, as you will see. World War 2 from BBC Primary History. Be a British kid in the time of World War 2 in Britain. Very good, concise, fact-filled, great to explore this site. Be a history detective checking out time capsules. Shop for food in 1943 with a ration book. Explore a wartime home with bomb shelters. Read letters. Find out what it was like to be evacuated on a train. What was The Blitz? World War II - The Home Front This is an excellent British site about what it was like to be a child in the UK during World War 2. WW 2 lasted six hard years for the UK, 1939-45. Covers evacuations, The Blitz, bomb shelters, rationing (with Excel game), what women did, propaganda, music of the era. A section for teachers explains the language arts lessons. We need a site like this for American kids, too. This is from the Snaith Primary School in East Yorkshire, UK, and is one small part of their BIG academic site! One downside - links to other UK WW 2 sites are broken. Would You Survive the Middle Ages? Do you have what it takes to tough out the Medieval era? Play this interactive game and find out! You'll also learn a lot about the Middle Ages. Then play its companion games, Who Would You Be in Medieval Times? "Queen or Damsel? King or Knight? Take this fun little quiz to see who you're best suited to be in medieval times :)", and What Is Your Medieval Profession? "Have you wondered what you would be if you lived in the Middle Ages? Would you spend your days walking about the royal gardens, or sweating at the stable?" Yorktown Victory Center "On October 19, 1781, the decisive military campaign of the American Revolution culminated with the British surrender to combined American and French forces under the command of George Washington. The Siege of Yorktown effectively ended the six-year struggle of the Revolutionary War and set the stage for a new government and nation." The best parts for online learning are the Yorktown Victory chronology, Yorktown and American Independence, and Militia in the Revolutionary War. You Are the Historian: Investigating the First Thanksgiving from Plimoth Plantation Online. This is the Plimoth Plantation historical park in Massachusetts that lets you step into the 1600s. Kids will find out amazing things here about Pilgrims and the Wampanoag people. Customs, food, houses, celebrations, and more; guided by two kids, one from each people. A great Flash presentation. Then, from the park's home page, click Learn on the top menu ribbon, go down to Just for Kids. There kids can download coloring pages, learn to Talk Like a Pilgrim, and tons of Homework Help! There is a Virtual Field Trip to the Wampanoag village (Where the people are Wampanoags, not actors), and to the Pilgrim settlement.